Nurseries provide opportunities for hands-on training and allow community groups to earn income from seedling sales. We are happy to work together with schools and community organisations to help with fundraising. If your local community group is interested in working with us please contact us for further information. We plan to hold Community Soil Blocking Days where neighbours, friends, families and like-minded people can come together and start their seedlings in a fun atmosphere. Get together and share knowledge and tools and take home your seedlings. 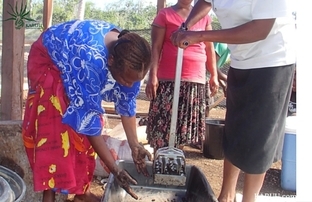 Conserve resources by sharing Soil Blocking tools. More information about the Community Soil Blocking Days will be added shortly. Since 2014, KABUU has been working together with Olympic Adult Education @ Alice House, a community gathering place in West Heidelberg. Together we run a seedling propagation project, sharing propagation skills to a small group of volunteers. The volunteers propagate and care for seedlings, which are sold at the Malahang Festival & The Olympic Village Makers Market. All proceeds go back into the project. 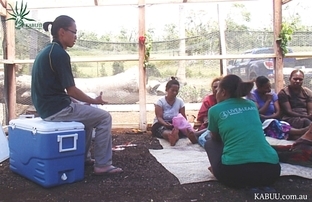 In November 2015, Richard Lee, from KABUU, traveled to Port Vila, Vanuata to share his knowledge of Soil Blocking with local growers. Following Tropical Cyclone Pam's devastation, three nurseries were started by Live & Learn Environmental Education Vanuatu to support local farmers. The project aim was to successfully transitioned the nurseries to using Soil Blocks and local compost to raise seedlings instead of plastic cell trays and imported potting mix. KABUU is grateful for being able to contribute a small part to a great initiative. KABUU acknowledges the support of Ladbrooke Soil Blockers UK, who donated Soil Blocking tools, and the Hurstbridge Sow & Garden Club.